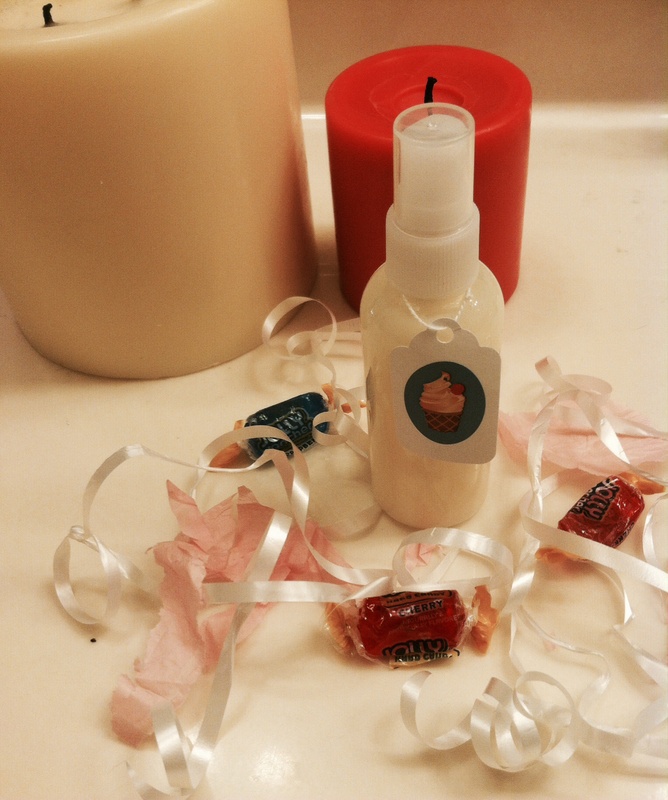 NEW BRAND: The Dessert Shoppe! Intoxicating skin softening spray-on lotions! Hi beautiful ladies! ❤ I am SO excited to share this with all of you, because i know you’re all gonna love it! 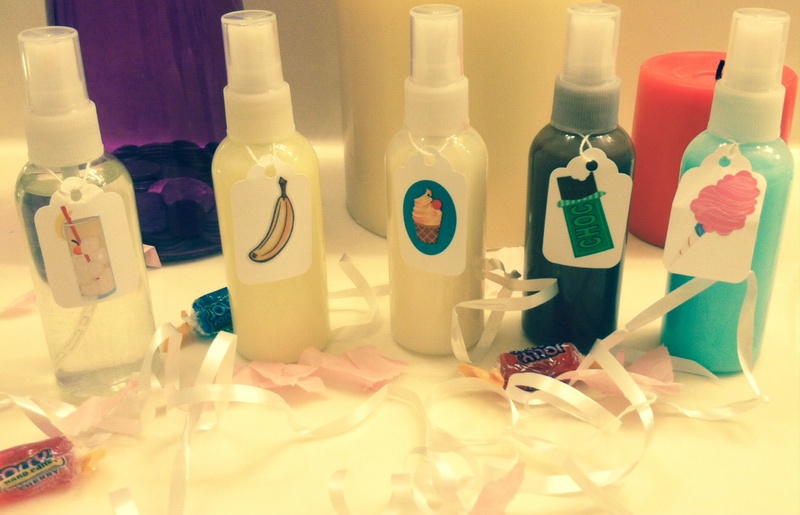 Recently, I have come across this adorable buisness on Etsy called “The Dessert Shoppe.” Just simply looking through the items she had for sale, i knew right away i had to get my hands on some of these super luxurious skin softening spray lotions that smell like heaven’s milkshake bar. 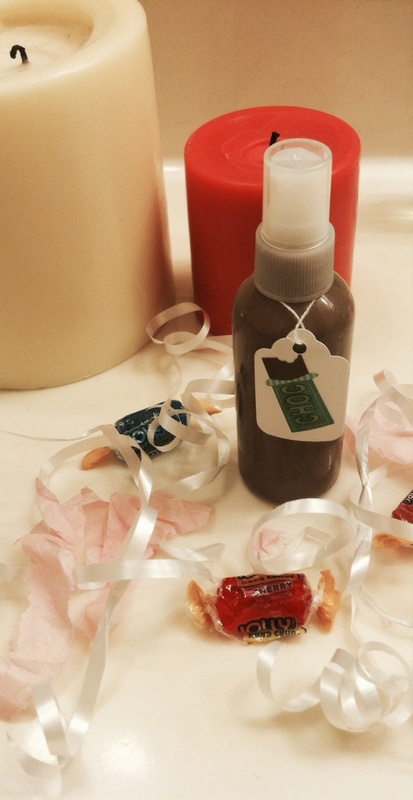 She has fun and exciting scents from banana, chocolate, rasberry and more! ❤ The very sweet shop owner Emilee, was kind enough to put together a sample pack for me to try out and review for all of you! So let’s get to it, shall we? 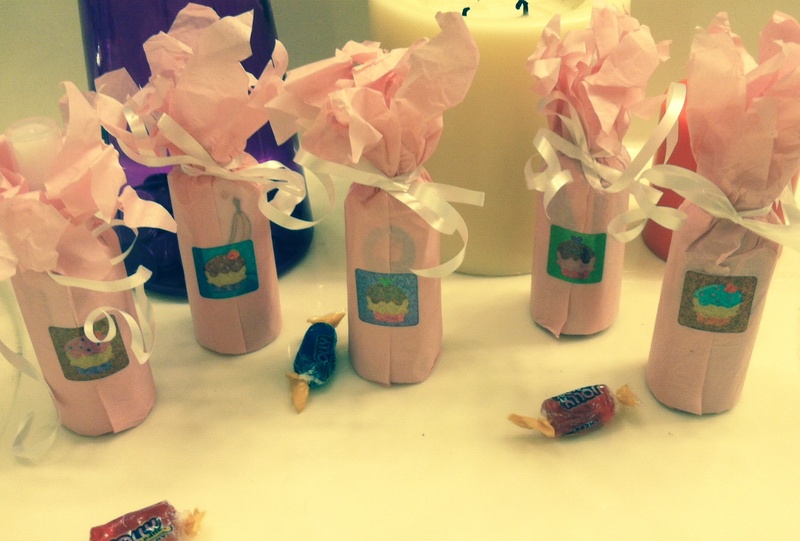 First of all, the way i recieved my samples was just so sweet and girly. I absolutely had to show you! 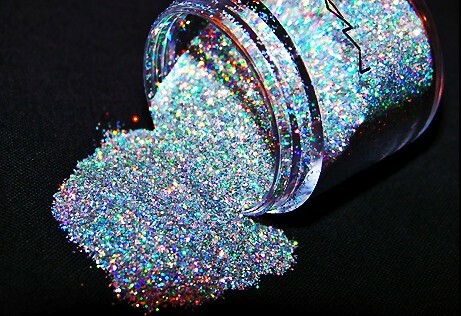 SO adorable, i love when the packaging looks as good as it smells! 😉 I find myself reaching for the prettier things in life more often. 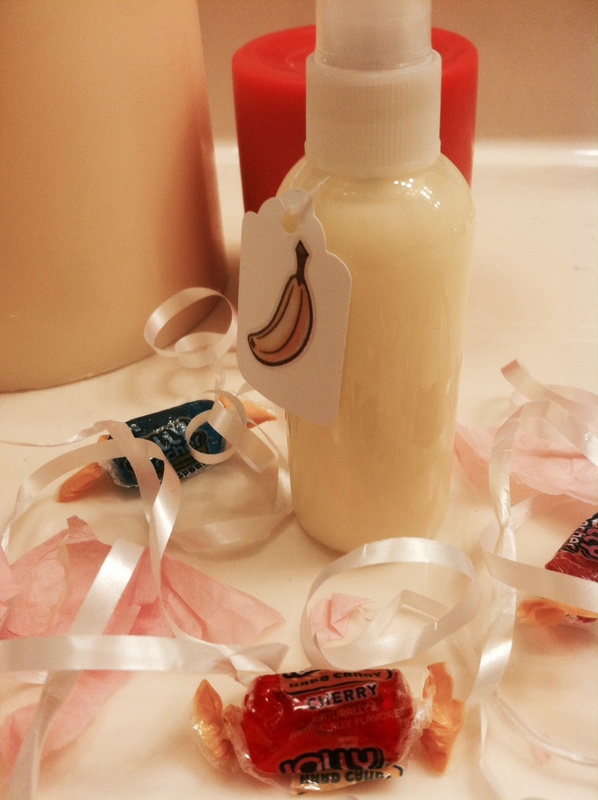 Next we have my personal favorite of the bunch, “Banana Milkshake” Skin softening spray-on lotion. 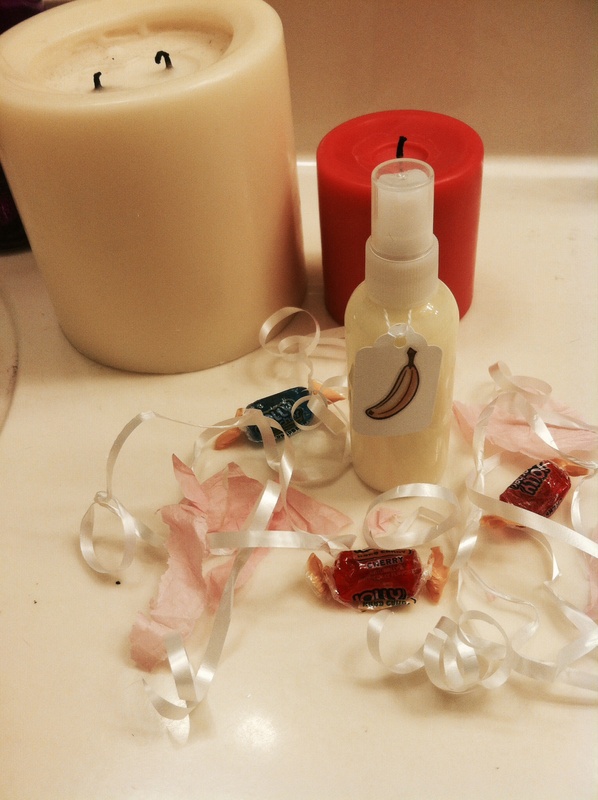 It smells SO good, to put it simply, if you like bananas you will love this! It’s like a banana’s and creme type of smell. 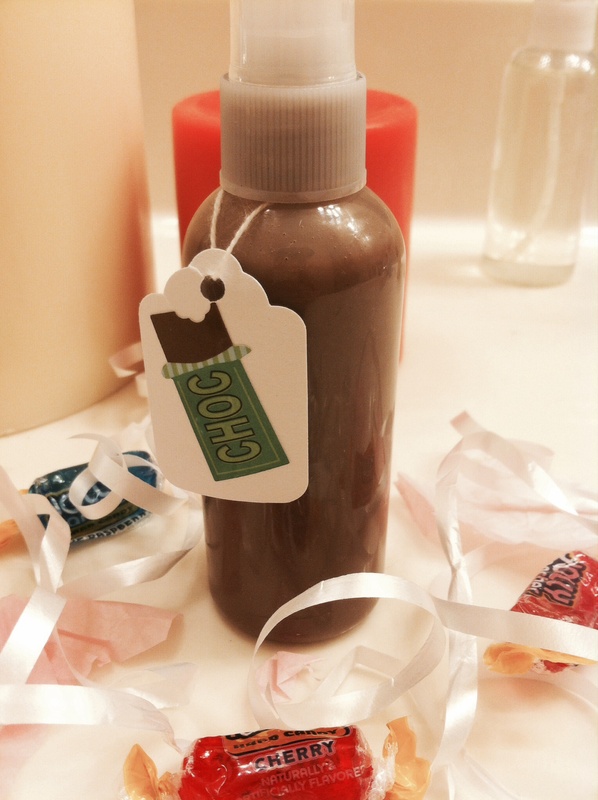 Now we have the “Chocolate Milkshake” spray! This literally smells like what a chocolate milkshake taste’s like. The formula of these sprays are so spot on, completely smooth and silky, easy to spray, lightweight. They just melt into your skin like butter and leave your skin feeling nice & soft. This smells like it has actual cocoa powder in it, so luxx! 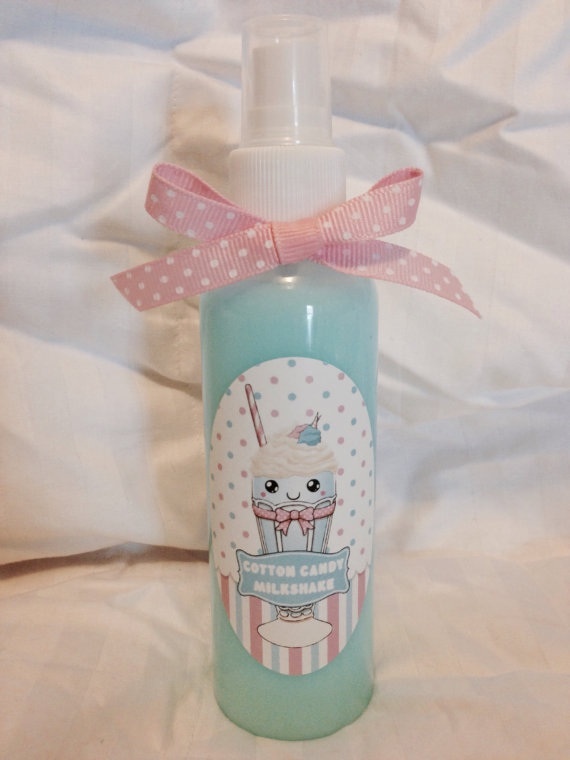 Last of the skin softening lotion sprays, “Cotton Candy Milkshake.” This has a very soft, nice cotton candy smell to it, it is not over powering or too sweet smelling like a lot of cotton candy sprays tend to be. Also, even though this one is blue and the chocolate milkshake is brown & banana is yellow, they do not leave any color deposit on your skin whatsoever. These full size bottles will last you forever and sell for $8.50 USD ea. Purchase yours HERE! 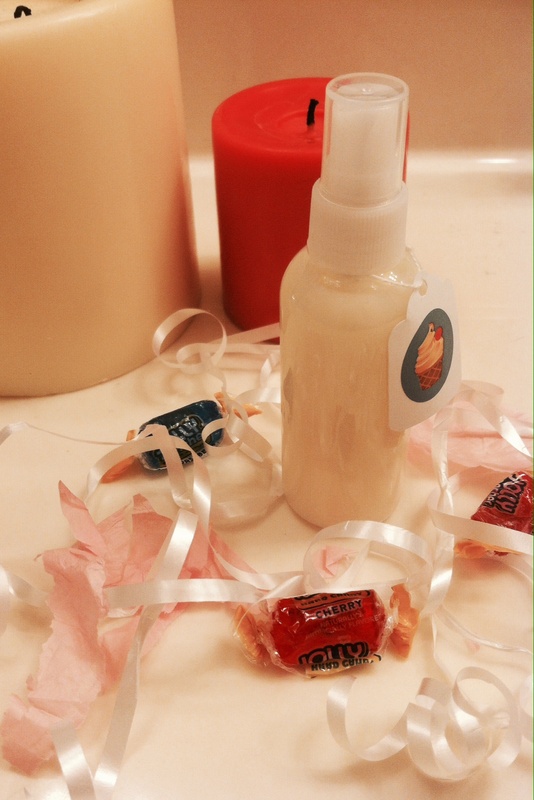 Last but not least, i got a “Cream Soda” Shimmering Body Mist. This is my other favorite, one reason being the lovely subtle shimmer inside the spray that leaves a gorgeous light catching effect on the skin. The other reason being that this actually smells like carbonated cream soda. 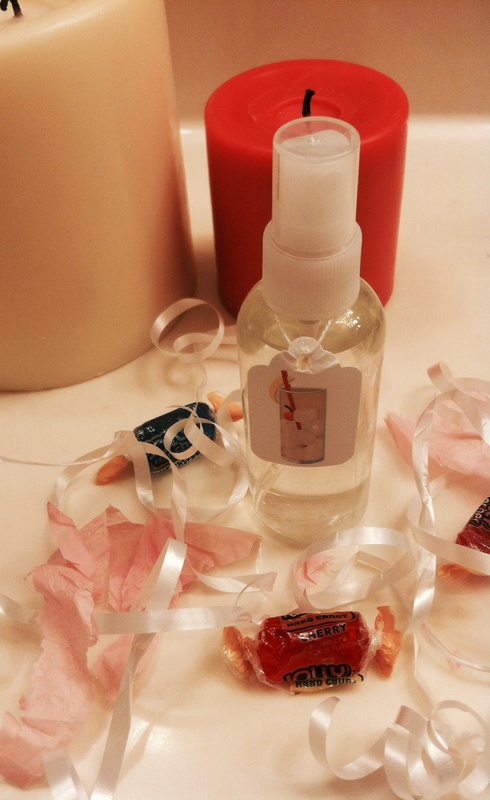 Since this one is not a spray lotion, but a body mist, it is not thick or creamy like the other ones. She really nailed every single one of these products, in smell, texture, and longevity. 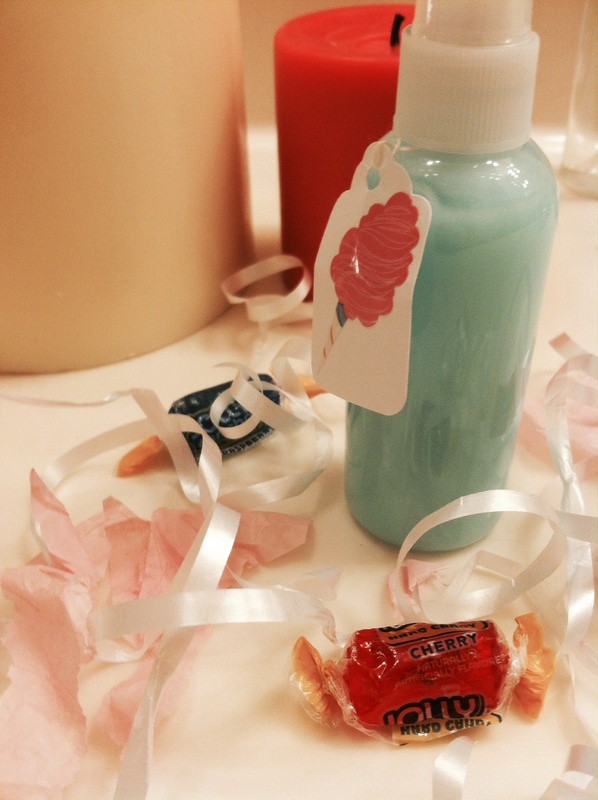 I definitely think you should all try out one of her sweet smelling sprays in a scent that stands out to YOU! You will love it, i am putting all of my fragrances aside for a while and i will be using these spray lotions instead. 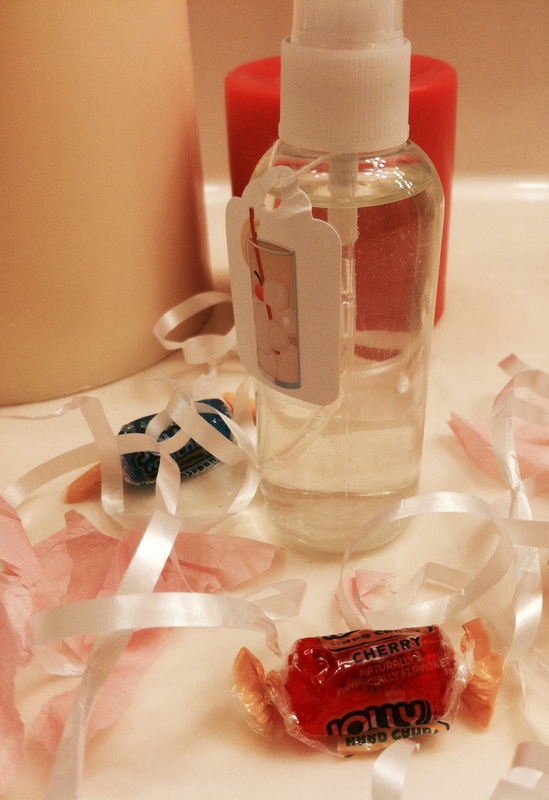 Why not smell great and hydrate/moisturize your skin at the same time?